I'll start with the modern bullion issues. These are silver, have been minted since 1986 and are .999 fine (99.9% silver), which is actually more than the circulating silver coins of fifty years ago. This "First strike" nomenclature as seen here is perhaps a bit of a marketing gimmick. 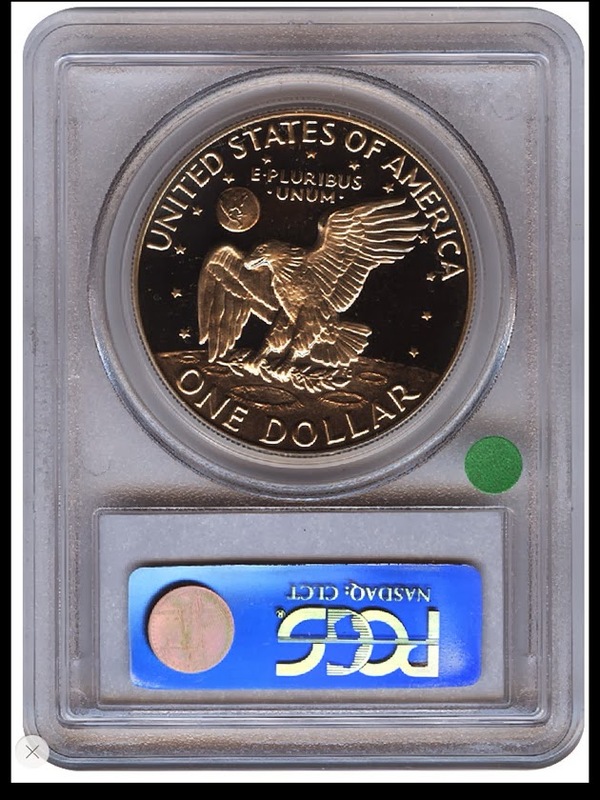 In order to get that designation, coins must be submitted to PCGS (the premier coin grading service) within the first 30 days of the Mint's release or in a mint sealed box with a postmark indicating same. Obviously that puts some upper limit on the number of these that can exist. It also says that the dies were newer rather than older, but it doesn't say anything about actual quality. The "MS70" says this specific coin is as good as it can get. The scale runs from 1 to 70, with 1 being a terribly worn piece and 70 being something like this. The quantity of MS70 examples is limited by reality, especially with large coins like this - the slightest ding while being handled can knock it right out of that 70 grade. Damage after packaging is less likely, but can happen: fire, floods, chemical contamination (these holders are not air or water tight), so the expectation is that these will become more difficult to obtain over time. Keep this in mind when buying high grade coins: just because the holder says it was graded at 69 or 70 doesn't mean it still is! Also realize that .999 silver is more reactive than .900 - it will tarnish more easily. Many of the beautiful MS70 coins put away now will not be bright in later years. Some will still be pretty, but others will not be. The value of previous year examples like this has risen significantly, but the real question is whether there will be long term demand for a non-circulating coin. Those who think that there will be point to Peace and Morgan silver dollars, which haven't been produced for circulation for almost 100 years and are very popular among collectors. However, many who remember these coins from their childhood are still living today; people of a younger age may have less fascination with them. Modern "circulating" dollar issues are also a bit questionable, because they don't circulate to any great degree either. The hope was that they would, because coins last much longer than paper money. They take up much more space, though, even at the smaller size like this Sacagawea Dollar coin below. "Presidential" dollars (2007 to date) are the most recent attempt, illustrated here by James Madison. I've never seen one of these in circulation and suspect that future generations will treat these (and perhaps the Sacagawea Dollars, too) as more like Commemoratives to be collected by specialists only. Whether that means that they will be worth more or less remains to be seen. There are some more rare issues that are missing edge lettering, but as you are unlikely to find these in circulation and most banks don't seem to bother with them, you aren't likely to find any of those. Sacagawea Dollars began in 2000 and are still made today. I've gotten them in change now and then, but rarely. People confused them with quarters, in spite of the coloring. By the way, should you happen upon a Sacagawea Dollar from 2000 with a "P" mintmark, it could be very worth your while to flip it over. There are two varieties that do have high value. The lesser is the "Wounded Eagle", which has a distinctive mark on the eagle's breast. I say "lesser", but uncirculated examples are worth at least a few hundred dollars and in more perfect condition, much, much more. The king (queen?) is the so called "Cheerios" coin. Many of these were packed in Cheerio's boxes and only a few dozen are known. There may be as many as 5,500 (that's how many boxes Cheerio's packed) but of course many were spent and who knows how many were simply not noticed and thrown away. Some may have been thrown away out of ignorance - the coin was brand new then and some people may have thought it was just a cheap token with no value at all! There is yet another version that is even more rare. Only one is known, so you aren't likely to find one. It has metal and coloring and the reverse of the Sacagawea Dollar, but the obverse is that of a State Quarter. I'd guess somebody snuck that out of the mint unofficially. Later, the reverse design changed (I don't have an example here). Should you happen to find a 2009 to 2011 date, look on the edge - there should be strong edge lettering. If it is weak, partial or missing entirely, that's a more valuable coin. There are several other possible reverses for Sacagawea Dollars - some people collect all of them. Some other interesting facts about Sacagawea's can be found in the comments at this thread. Did you know that some gold versions took a trip on the space shuttle? There is a long series of modern commemorative dollars starting in 1983. These cover everything from the Olympics (1983) to the Girls Scouts (2013), with more to come. I don't collect any of them, though eventually I'll probably add a representative example. Another issue faces all coinage: the day is not all that far away when all money will be digital. Will a generation that grew up without ever using money have any interest in any of this? I'm sure some still will, but most of us started collecting because we could find dates in our (or our parents) pocket change. Sure, some people collect things that can only be bought, not found, but I suspect that's a tiny number, and it's usually not things as common as coinage. As the old timers pass away, large collections will pass into the hands of perhaps very uninterested people. Long term, I'd expect the value of all coins to go down - though there may be a bubble as digital money first takes over. But that's all still at least decades away. Let's keep moving looking at dollars. Susan B. Anthony dollars were made from 1979 to 1999. These were the first attempt at a smaller dollar and both the color and the hexagonal shape were supposed to make these easy to distinguish from quarters, but it wasn't enough and few circulated. The Mint is really in a hard place here. Smaller coins get confused and larger coins are disliked for bulkiness. If these coins did circulate, the 1979 "Wide Rim" carries a premium price. But they really don't. Some get spent because kids may get a few as gifts, but the shopkeepers hardly ever offer them as change because customers prefer bills and perhaps because they don't have a slot for them in their change drawer. Back to the bank they go, to await the next doting grandparent who wants some. That's pretty much true for half dollars, too, though I do still get a few in change. It's interesting to note that this same situation existed for Morgan and Peace silver dollars when I was a boy. Children got them as gifts and the stores would quickly turn them into the banks. Half dollars still circulated well until thirty years ago and then dropped out of sight in most places. I rarely see them now, but the ones I do see generally show some wear, so they must kick around a bit. Some places use them deliberately as attention getters; there might be someone doing the same with dollar coins, but I haven't heard of it. Like every later attempt, this was a dismal failure other than with collectors and use in casinos. You may hear the terms "blue Ike" or "brown Ike". These refer to the colors used by the mint when they sold these: proof versions came in a brown box, the regular uncirculated silver pieces were in a blue envelope. Those silver issues were 40% silver overall. Circulation issues were supposed to be only clad (no silver at all), but about 30 1974-D and 15 1977-D made from 40% silver planchets are known. Your chances of finding another are of course as close to zero as you can imagine, but should you ever be handed one of those dates, why not look? I'm not a big fan of Ike Dollars. The design is attractive enough, but clad is ugly and it gets uglier as the coin gets larger. The 40% versions aren't bad because they aren't 40% throughout; the outer part is 80% silver and does look much better. This concludes Part 1. I'll cover "real" silver dollars (coins that really circulated) next time.